They don’t say “Virginia is for Lovers” for no reason! Sandbridge is not only the perfect vacation destination for the entire family, but it’s also in no short supply of romantic opportunities. Here are a few date options for couples of all ages to enjoy on their vacation. Whether you’re looking for romance, adventure, or just some old-fashioned quality time, one of these ideas is sure to impress. There are few things more romantic than enjoying a beautiful sunrise or sunset on the beach with your significant other. Keep an eye on the weather and try to pick the clearest day of your vacation so that too many clouds won’t fog your view, especially if you opt for the sunrise view. If you want extra brownie points, pack a surprise picnic or some mimosas to enjoy while you take in the sights and sounds of the ocean together. If you bring the kiddos along on vacation and have someone to watch them, you might even be able to sneak away and enjoy some alone time on the beach before they wake up. Back Bay National Wildlife Refuge has all the beautiful scenery you could ask for. From beach views to the woodlands and marshes that stretch over 9,200 acres, this is the perfect place for outdoor-lovers to go on a peaceful nature hike. A fun addition that would double as a way to remember your Sandbridge Beach vacation would be to have a photography competition during your hike. Take pictures of different scenery and any wildlife you come across during your hike (and don’t forget pictures of/with each other) and choose a winner at the end…loser buys ice cream at Sandbridge Sugar Shack! Speaking of the Sugar Shack…treat your significant other to coffee, ice cream or frozen yogurt and then rent a couple bikes and explore the area. Keep an eye out for special events going on like live music and face painting. They also do fun specials like “dress up like a mermaid or a pirate for 50% off” which sounds like a date all by itself! While not specifically in Sandbridge, the Virginia Beach Guided Craft Brewery Tour is a fun, and educational, date idea for beer enthusiasts. You’ll be provided transportation to and from each brewery, guided through each brewery for a behind-the-scenes experience. With over 5 breweries in Virginia Beach, your sure to find your new favorite brew. For the sporty couple, Hell’s Point Golf Club has a beautiful and challenging course for all ages. With a well-maintained course and wide variety in holes. If you’re a couple who enjoys a little friendly competition, this date idea will be fun and occupy a good amount of time when you’re all beached out for the day. 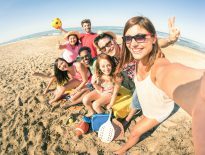 If you’re vacationing with other couples, you could even make it a group date! With over 10,000 animals, the Virginia Aquarium is perfect for the animal loving couple who wants to see and learn about local marine life. The Aquarium does daily events like movies and talks with the keepers. There are also featured events that vary throughout the year. You and your significant other could get the chance to see training demonstrations, go on a nature exploration of Owls Creek, or a wide variety of other special events. The aquarium is one of those special places that you can spend hours exploring and still find new critters to fall in love with. In addition to the Aquarium, is The Adventure Park! If you’re looking for an adventure this is the place to be, hence its name. With 15 trails, 21 zip lines, and almost 200 challenge bridges, this is the largest forest climbing park in the nation. You can even choose your difficulty level to suit both of your needs, so you don’t need to be an experienced climber to have tons of fun together! Blue Pete’s is a popular restaurant located in Back Bay serving fine seafood and steaks since 1972. To make dinner even more interesting, Blue Pete’s Sunset Dinner Tour takes you on a one-way kayak tour from Surf & Adventure Co. to Blue Pete’s. Take in the beautiful sights, wildlife and natural beauty of Back Bay and enjoy a delicious meal for a little bit of adventure and romance all at once. 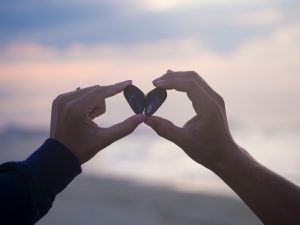 There are plenty of other things to do in the Virginia Beach and Sandbridge area, but if you can’t get away long enough for one of these date ideas or you’re on a large family vacation, no worries! Just being in Sandbridge with your loved ones is an awesome time that you can all cherish and remember for years to come.